Abid Hoque is a Senior Project Manager and Implementation Specialist at 3CLogic, innovator of the leading cloud communication platform and Now certified, natively integrated application available in the ServiceNow store. 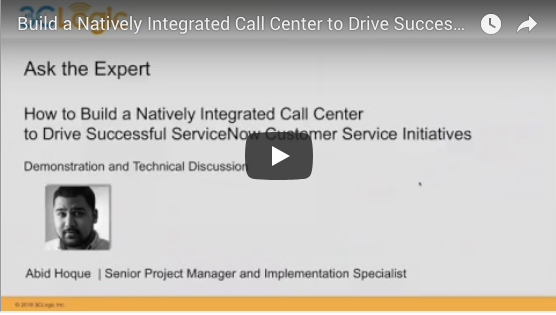 He’s implemented 3CLogic's cloud contact center solution for enterprise clients for the past 5 years and is a leading technical expert on the integration for ServiceNow. 3CLogic has the only native ServiceNow certified platform CTI application developed 100% within ServiceNow. No additional resources, platforms or services are required. Enterprise organizations can operate their call centers from a single, consolidated platform leveraging a unified agent and administrator experience to simplify the delivery of high quality customer engagement and support. Read the press release for full details. Interested in scheduling a demo for you and the members of your team? Send us an email or fill out this quick online form.